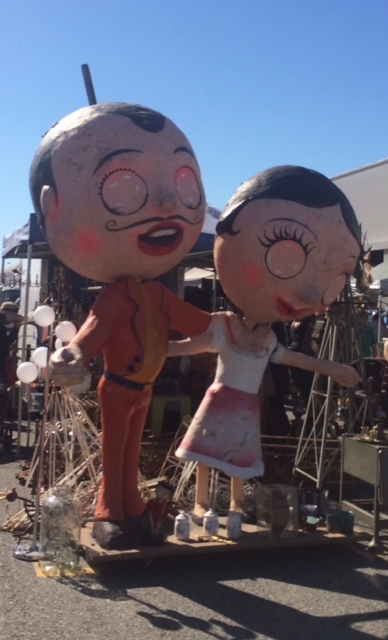 This weekend, I wandered over to Long Beach to check out the flea market that happens once a month. When I went before, I was impressed because I say so much good stuff and it was so much cheaper than Rose Bowl. It has been a while, and I think Long Beach must be more popular than ever because I feel like prices skyrocketed. 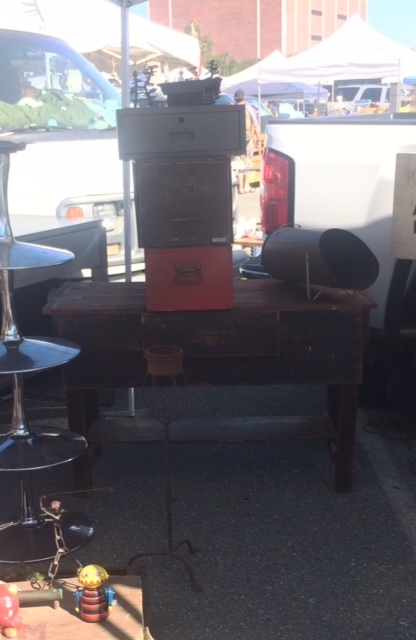 Flea Markets are hit or miss, and where Rose Bowl this month was a major win for me, this trip was a miss. Everything I wanted to buy was priced a little too high for me. 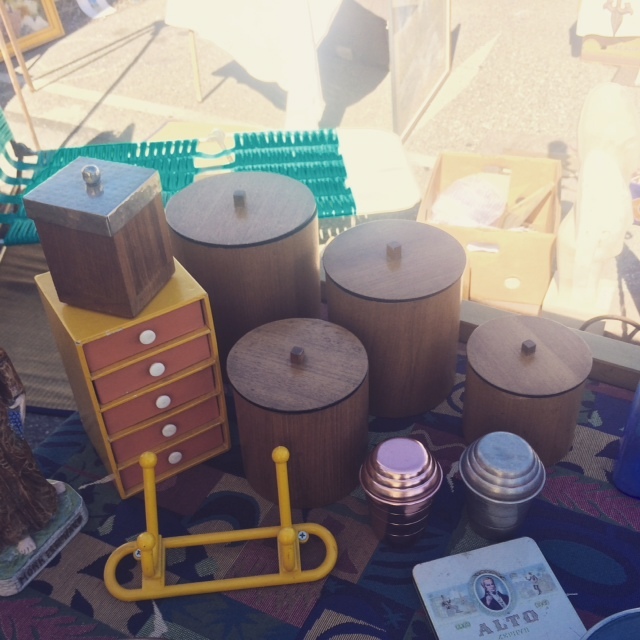 I was obsessed with these wooden cannisters, but the vendor was asking $70 for the set, and that just felt like too much. The $70 canisters just seemed a little too expensive. I did end up buying a set of glasses with midcentury looking wooden sleeves and a matching tray, but I came home feeling like I got ripped off. The guy told me that they were “Eames,” and while I didn’t believe him (no markings, no stickers, I’d never heard of a set like this), I was hoping they were a knock off of something else. After a ton of searching after bringing them home, I can’t find much on them. Here’s what happened: I went over to negotiate and another lady started looking at them. I got so caught up in someone else wanting them and “winning” the score that I told the guy I would take them outright. I was so upset about it, I haven’t been able to bring myself to take a photo yet. I guess the best way to learn is to make mistakes, and this has been one of those “learning experiences.” Don’t get me wrong, it is a cool set, but I think I just paid too much for it. I’ll show you guys a photo later this week when I get it cleaned up. I loved this colorful stove. 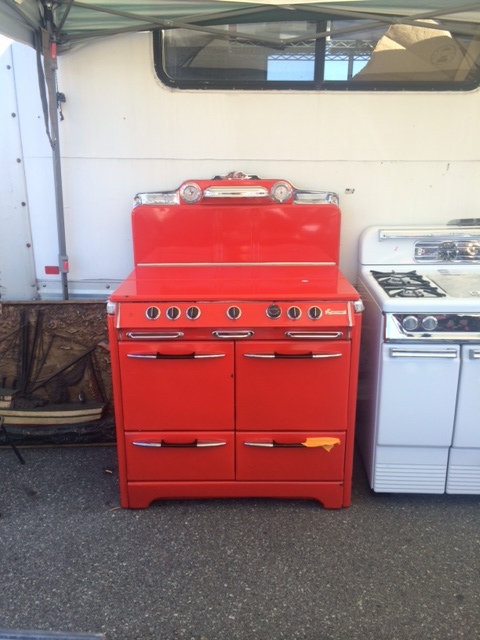 The guy had stoves in pink, red, blue, and classic white. 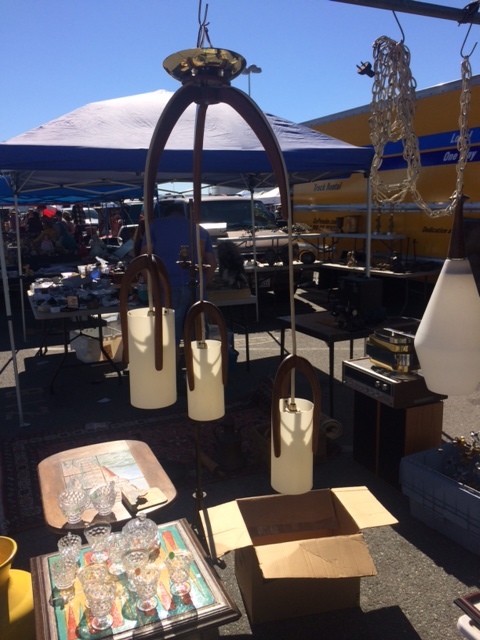 This light fixture was really cool, and was actually a good deal at $325. I liked the finish on this table. Which Long Beach? CA or WA?